With so many web sites that have trail information, we are concentrating on 3 locations to keep our trail information as current as possible. Our club plans weekly rides every Tuesday during the season. Everyone is welcome to join us, you do not have to be a club member to join our rides. We meet in downtown Phelps across from the Post Office at 9:00 am. We ride about 50 miles to a restaurant/bar and return to Phelps around 3:00 pm. We also plan a three or four day trip each year that includes destinations such as Copper Harbor, Iron Wood, or Marquette, Michigan. Contact us on Facebook for more information about our rides. 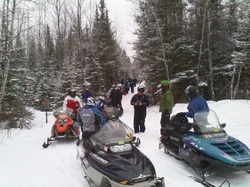 The Phelps Snowmobile Club is a volunteer organizaton that maintains 40 miles of the most pristine trails in Northern Wisconsin, Vilas County. Our trails are deep in the Nicolet National Forest and include North and South Twin Lakes and Lac Vieux Desert Lake on the Michigan border. Along the trails are several restaurants, bars and gas stations to stop in for a break.